Can the Corp still place advancement counters on cards through card abilities while suffering the effects of The Price of Freedom? Yes, only the action of advancing cards is forbidden. 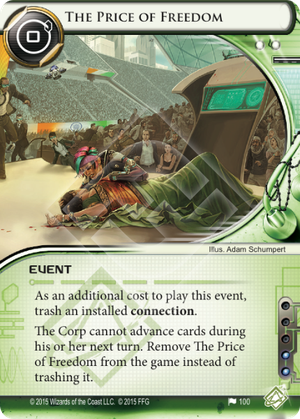 I love both this card and The Black File, because they provide new and interesting ways of halting a win from the corp. While cards like these can be good against any kind of deck, they feel like specific answers to everyones' most and least favorite kind of decks, fast advance decks. It's easy to feel like the shapers got the raw end of the deal, at least at first glance. Sure, the effect is powerful, but it doesn't make a win by scoring impossible, unlike The Black File. There's any number of shenanigans that a corp could pull to get advancement tokens on an agenda (or asset (or ice))) without technically advancing it. And though it may not cost any creds, it's a click and an installed connection being trashed to boot, which is another click and some creds. So this card costs two clicks, and usually somewhere around 1-3 creds for for its cost. Still not all that bad imo, but it's not foolproof, and it'd be a shame to use this before a turn they weren't planning on advancing anyway. Still, I don't think the card is unusable. If you had a deck that had a large hand size and good drawing power (things Shapers are great at), you could pull off a power play where three turns in a row you could keep the corp from advancing cards. One turn may not have any impact at all, but three in a row? That could be stifling. Especially if you mitigate some of the cost. Use Akshara Sareen as your sacrifice every time (which is both thematically appropriate and horrifying) and now the cost of this card is a single click. Street Peddler is another sacrifice that isn't too bad either, if there's only redundant or unplayable cards on it. Unfortunately this does make The Price of Freedom costs two clicks. Since they're likely to be holding agendas in their hand after all this punishment a Utopia Shard, or Legwork, or both could work very well to punish the corp after your onslaught. And hey, worst case scenario, they use some of those myriad ways of advancing previously mentioned and score on the turn this card's active anyway. At least you got them to use those resources up now instead of when they're about to win. In the end, I still don't think it's as good as the file, but it's fun, and I don't think it's bad. I hope someone surprises me and uses it well.